The ceramicist, designer, and painter Margarete “Grete” Marks experienced many obstacles over the course of her career. [i] She not only faced great tragedy in her life, but her gender, ethnicity, location, and ultimately, her timing made continued success for this talented artist much more difficult. Grete Marks was born in Cologne, Germany to a wealthy Jewish family that owned a textile business. She was well educated and from an early age she showed an interest in music as well as the visual arts. In her teens Marks began studying painting at the College of Applied Arts (Kunstgewerbeschule) in Cologne and the Academy of Fine Arts (Akademie der bildenden Künste) in Düsseldorf. She enrolled at the Bauhaus in Weimar, Germany in November of 1920. Initially, Marks took preliminary courses under esteemed masters Johannes Itten, Georg Muche, and Paul Klee. Afterwards, she was allowed a trial semester in the school’s ceramics workshop under Gerhard Marcks’ direction. [ii] However, difficulties arose when Marks asked for full admittance into ceramics. Notes from the Masters’ Council meetings at the Bauhaus reveal that a decision on her entry was repeatedly delayed. In one of the final Council meetings, that addressed the subject, Gerhard Marcks explained that “he considers [Marks] to be talented…but not suitable for the workshop.”[iii] This comment came after months of postponements. In truth, at the Bauhaus, both sexes were not treated equally. The school’s founder, Walter Gropius, may have proclaimed that there was “no difference between the beautiful and the strong sexes,” but most female students were steered towards more womanly arts such as weaving. [iv] Frustrated by the circumstances, Marks left the Bauhaus in 1921. She never received the prolonged admiration that was showered upon many Bauhaus students and masters. After her departure, Marks taught a pottery course for children and worked briefly at a ceramic workshop in Frechen, Germany. She also held a position as a designer at the Velten-Vordamm stonework factories near Berlin. In 1923 she married the economist Gustav Löebenstein. With Löebenstein and his brother Daniel, Marks founded Haël Werkstätten für künstlerische Keramik in Marwitz, Germany. [v] Haël quickly gained popularity acquiring an international clientele. The company offered a range of ceramic products that were highly praised for their ingenuity. Some of their most memorable designs included simple forms with bold abstract brushstrokes as well as pottery with glazes inspired by ancient Chinese ceramics. Also notable was Haël’s use of geometric shapes. Marks contributed greatly to Haël’s success. She skillfully created a wealth of commercial designs that appealed to the varying tastes of the modern buyer. While Haël was active, Marks produced designs in silver as well as in silver-plated nickel silver. 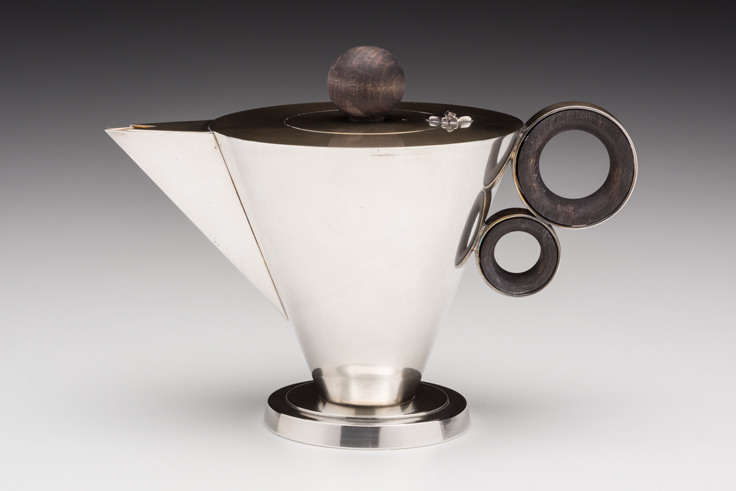 [vi] While the silver versions were made by the Richter-Engel workshop in Saarbrücken, Germany, very little is known about the origin of her nickel silver creations such as this teapot in the Kamm’s Collection. These forms, however, closely resemble some of Marks’ ceramic work. [vii] They are geometric structures with inverted conical bodies and handles made of two attached circular forms. The Kamm’s teapot also has a stepped circular base and a sizable triangular spout. The two circular rings that create its handle are made of an ebony-like plastic that is banded with silver. Another distinctive feature is the ebony ball finial that rests on the teapot’s flat hinged lid. The Nelson-Atkins Museum of Art has a tea service with similar characteristics in its collection. In 1936 Marks emigrated to England. She settled initially in Stoke-on-Trent in Staffordshire, an area known for its pottery industry. Marks taught at the Burslem School of Art and worked for the Minton factory designing prototypes for tableware. In 1938 she opened her own business called Greta Pottery. [xii] The designs she produced closely resembled her work for Haël with a focus on geometric shapes and modern patterns. Unfortunately, these productions did not receive widespread acclaim. Mainly, this was because English ceramics were more conservative in nature and its industry, particularly in Staffordshire, was less progressive. In 1940, with the start of World War II, Marks closed Greta Pottery. Since Marks’ death, greater emphasis has been given to her contributions to the fields of ceramics and design. She certainly produced an impressive body of work that deserves this recognition. Unfortunately, this is a story of a “gifted and gutsy” woman who was impacted by her time and place in history. [xiii] However, no matter the obstacles, she persisted. In a striking, often published picture of Marks from the 1920s she is dressed in a masculine button-down shirt with a tie. Her hair is cropped short. Without a doubt, this strong independent woman was determined to pursue her passions. Hudson-Wiedemann, Ursula and Judy Rudoe. “Grete Marks, Artist Potter.” The Decorative Arts Society Journal 26 (2002), 101-119. McGown, Katie. After the Break: Grete Marks and Laure Prouvost. Canterbury: University of Kent, 2016. Müller, Ulrike. Bauhaus Women: Art, Handicraft, Design. Paris: Flammarion, 2009. Milwaukee Art Museum Blog. A Time When Modern was “Degenerate”. [i] Grete Marks is identified by many names. She was born Margarete “Grete” Heymann. After marrying her first husband, she was known as Margarete Heymann-Löebenstein and Grete Löebenstein. For our purposes here, she will be referred to as Grete Marks since this is the latest version and the most commonly used. [ii] Follow link to Gerhard Marcks blog post on the Kamm Teapot Foundation’s website. The Bauhaus ceramics workshop was in Dornburg, Germany. [iii] Ulrike Müller, Bauhaus Women: Art, Handicraft, Design (Paris: Flammarion, 2009), 72. [v] Haël: H (pronounced “Ha” in German) comes from Grete Marks’ maiden name Heymann and L is from her husband’s name Löebenstein. [vi] Nickel silver is a copper alloy with nickel and often zinc. Sometimes it is called Alpacca. [vii] The Kamm Teapot Foundation has a ceramic tea service in its collection that resembles this silver-plated nickel silver teapot. The forms in the clay set contain inverted conical bodies and circular disk-like handles. [viii] Also, in 1933 Marks suffered the loss of one of her two sons in an accident. [ix] Haël was sold to Heinrich Schild, who was a Nazi Party member and the general secretary and officer for the Consolidation of Institutional Powers of German Craft. His business partner was the potter Hedwig Bollhagen. [xii] She opened Greta Pottery with her new husband Harold Marks. [xiii] Alice Rawsthorn, “A Distant Bauhaus Star,” The New York Times, 1 November 2009.